Though YouTube video are available to download via YouTube App since the end of 2014, YouTube offline video downloader is still widely applied because of the defect of videos YouTube App downloaded. For example, the video saved is in segments and EXO format which is not allowed to copy and share to other devices since you cannot decrypt it and the save space will enlarge greatly. Thus people still take advantage of downloader, owning to its simple steps of save YouTube videos offline. In general, people download YouTube videos in three ways. Desktop software enables you to get YouTube videos for offline playback with the option of bitrate, more video formats, deinterlacing and even the ability of bad sectors recovery. So people prefer to use YouTube offline downloader to save YouTube videos for offline playback and sharing. Of course, all these are in the premise of owning awesome software like YTD Video Downloader, Fast YouTube Downloader, MacX YouTube Downloader etc. Take MacX YouTube Downloader for example. It is specially designed for Mac users to download videos of different resolution and formats free from YouTube, Dailymotion, Vevo, Facebook etc. As it keeps the spirit of simplicity while adopting advanced technology to make the video downloading process easy and fast. Furthermore, the advanced edition - MacX Video Converter Pro enables people to convert YouTube video downloaded to MP3, MP4, MOV, FLV, MKV etc., any formats you wanna to watch YouTube offline on iPhone iPad or Android devices. Step 1: Free download the best YouTube offline video downloader. Click "YouTube" button for video downloading, copy and paste the target YouTube video URL to the box frame. Or directly "Analyze & Paste" to automatically detect the video details. Step 2: Choose video format, resolution, etc. you want. Step 3: 3.Click "Browser" button to specify the output path for the target YouTube offline downloaded video. Step 4: Hit "RUN" button to start legally download video from YouTube for offline enjoyment. Making use of the specific website to analyze the URL of the video for YouTube offline viewing is another popular way to download YouTube videos for those who want keep their PC clean without installing anything. It's extraordinarily simple and convenient to download YouTube videos offline in MP4, FLV, WebM etc. of 480P, 720P, 1080P. However, it's a shame that some videos need to be decoded which will cost too much time when take advantage of the online website like Keepvid, Clipconverter, Fetchvideo etc. as the YouTube offline downloader. 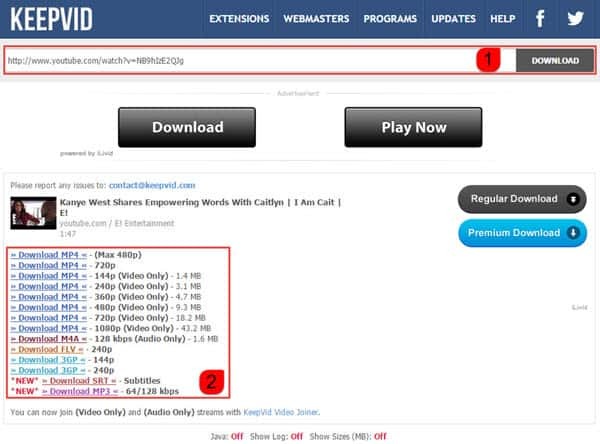 Step 1: Go to the specific video download online website like Keepvid. Copy and paste the target YouTube video URL to the message box. Then click download to start detect the video details. Step 2: Choose the video format, resolution, single audio or video etc. and start downloading. Add extensions to download videos on YouTube Page is the most direct and handy way among YouTube free downloaders. But it's really complicate to install for the first time. Even worse the max resolution can only reach 720P which is a pity for people pursuing UHD YouTube offline viewing. 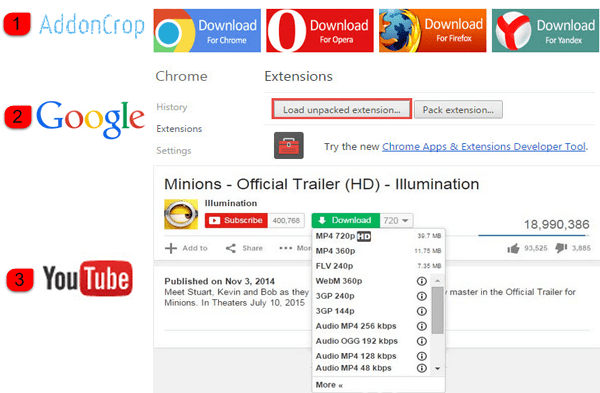 Step 1: Go to AddonCrop to download YouTube Video Downloader extension for the browser you use. And decompress it to file folder. Here in Chrome, for example. Step 2: Go to the chrome browser to enter the extension interface and add the newly downloaded extension. Step 3: Visit the ideal YouTube page where you can download YouTube videos offline directly. Well, I cannot tell which is the best way to download YouTube videos offline, either which is the best YouTube video downloader for different people have different needs and preferences of video downloading. No matter the YouTube offline app downloader, website, extensions or YouTube offline download software, just choose the most suitable one to meet your demands of YouTube video downloading.